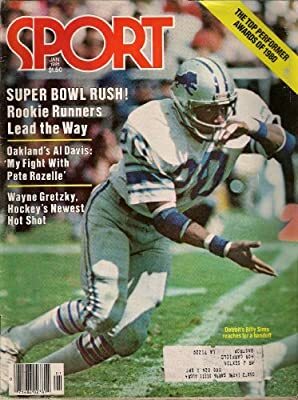 Billy Sims Detroit Lions Sport Magazine January 1981 Al Davis Wayne Gretzky! Product prices and availability are accurate as of 2019-04-22 22:38:51 UTC and are subject to change. Any price and availability information displayed on http://www.amazon.com/ at the time of purchase will apply to the purchase of this product. JANUARY 1981 ISSUE OF SPORT MAGAZINE. THE COVER FEATURES BILLY SIMS OF THE DETROIT LIONS. ARTICLES INCLUDE "OAKLAND'S AL DAVIS: MY FIGHT WITH PETE ROZELLE", AND "WAYNE GRETZKY, HOCKEY'S NEWEST HOT SHOT".